I'm Here. I'm Queer. What the Hell do I read? : Hope, Part 2: A 3rd Grader puts together a rally of hundreds of people for same-gender marriage! 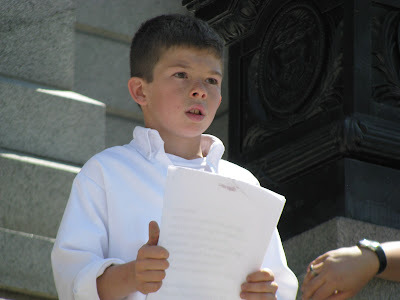 Hope, Part 2: A 3rd Grader puts together a rally of hundreds of people for same-gender marriage! Times like these make us yearn for hope. And this child, nine year old Ethan - who is so wise, gives it to us. UPDATE: HERE'S VIDEO OF ETHAN'S RALLY!!! First I want to thank everyone for coming, specifically the speakers that took their free time to come and speak and support me and equal marriage rights. I believe that I am doing the right thing and it will help lots and lots of people and make many lives better. I believe that everybody is equal. No matter their religion, race, or sexual orientation. In the past different figures in history have improved civil rights, like Martin Luther King and Ghandi. And things got better. But not for everyone. We need to continue to fight for equal rights for gays and lesbians. Over time things have gotten better for gays and lesbians, but there are two things that have not improved: 1. equal protection for gays and lesbians and 2. Equal marriage rights for gays and lesbians. see a straight couple get married? People marry because they love each other and want to stay together the rest of their lives. That’s important to children and to adults. If you are married you can go to the hospital to see your partner. If you aren’t married you can’t be there if your partner is sick or dies just because you are gay and lesbian? Do you think that’s fair that one person can stand by their partner when they are sick but a gay or lesbian person can’t? But getting married is not only a right but a responsibility. In conclusion, there is a lot more work to be done regarding marriage equality and equal protection. I hope this rally will make an impact and let our voices be heard. Once again I would like to thank everybody for coming. Wow. I have another new hero. And I feel hope for the future of our world! Thank you Ethan. And thanks to your Mom and to your teacher for supporting you in this amazing step for Gay rights! Awesome. :D I hope that kid runs for office some day.